1. Uses ultrasonic technology to stop barks,this product aims to solve excessive, noisy dog barking by emitting an ultrasonic sound to silence the dog. 2. Sensitive microphone isolates and picks up barking up to 50 feet away to stop barking both outdoors and indoors,to solve your dog's or your neighbor's dog's disturbing barking problem. 3. Four adjustable ultrasonic volume levels - test, low, medium, and high, with LED battery power level indicator,and this is the perfect solution for some peace and quiet from loud, barking pets. 4. 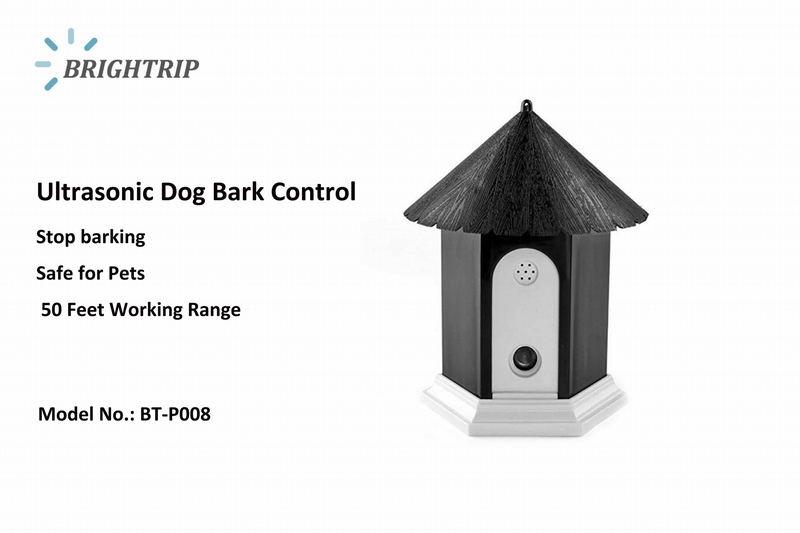 Safe and humane method of bark control, suitable for all breeds and sizes of dogs,the ultrasonic frequency is not harmful to pets and completely inaudible to human ears. 6. How it works : Insert a standard 9-volt battery into the Ultrasonic Dog Bark Controller in Birdhouse Shape. The unit is automatically activated by the sound of barking. When the device is within the range of a barking dog, the microphone will isolate and pick up the barking to emit an ultrasonic sound to silence the dog.